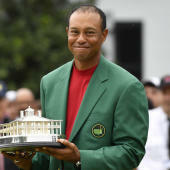 AUGUSTA, Ga. -- The final round of the 2019 Masters is nearing its completion, and Tiger Woods has emerged at the leader as we roll to the finish at Augusta National. Will Big Cat pick up his fifth green jacket? You can watch their final round live on CBS, CBSSports.com and the CBS Sports app. For many, the opportunity to attend the Masters once is a dream. But the truth is that being able to watch golf on the grandest stage of them all over four straight days is an incredible treat each year for golf fans whether in attendance, at home, on the road or -- shh! -- at work. CBS Sports is thrilled to bring you wall-to-wall coverage of the Masters with a variety of methods in which you can view the sport's signature event -- on your television, streaming online and even on your mobile device. Sign on and view now, because it's almost over! Enough talking about it. Here's how you can watch as much Masters as possible on Sunday. Be sure to stick with CBS Sports for live coverage throughout and download the CBS Sports app to watch Masters Live on your mobile device.